Here in the United States of America we have been celebrating first harvest since 1621, when we were still colonized. That “First Thanksgiving” feast actually lasted 3 days and was attended by 53 Pilgrims and 90 Native Americans (Wampanoag Indians) according to Edward Winslow, who was a leader among the Pilgrims. Even now, Thanksgiving Day is celebrated every year as a federal holiday in the USA since 1863 when President Abraham Lincoln gave the proclamation that we set aside one day as a day of: “Thanksgiving and Praise to our beneficent Father who dwelleth in the Heavens” . Originally designated as the last Thursday in November, today the USA observes the federal holiday on the fourth Thursday of November. Canada also has a similar national holiday, which is celebrated on the second Monday in October each year. Harvest festivals are celebrated all over the world. You can search the Internet to find celebrations in Africa, Algonkian, Australia, Balinese, Barbados, Britain, China, The Czech Republic, Egypt, France, Germany, Greece, India, Ireland, Japan, Korea, Lithuania, Malaysia, Nigeria, Poland, Rome, Scotland, Slovakia, Sweden, Vietnam, and Zambia and probably others that I do not mention here. Thanksgiving is among my favorite of holidays. Mostly because it is a cherished time with our family and even some close friends. I love to hear about individual family traditions for Thanksgiving. When we moved to New Mexico from northeast Ohio several years ago we were blessed to join new friends and their very large family. There we learned about some of the New Mexican traditions and enjoyed some new food choices at the feast. One thing that I will always remember is the first time I ever saw very, very hot red chili (a pureed smooth gravy-like sauce) served over the mashed potatoes. Thankfully, I was wise enough to know that had I tasted that diabolical gravy the feast would have been ruined for me. Though my husband loved the spiced up taters, I ate mine with just a little butter, salt and pepper, and no gravy! Barring the devil gravy, all of the other food was delicious and much of it was simply turkey and the fixins. A few years later we were introduced to calabacitas (which is really the Spanish word for zucchini). This side dish now joins our annual fare and is a New Mexican dish made up of squash, corn and green chili. Though much food is something that we anticipate, we also love to share prayers of thankfulness for the abundant blessings of the year. It is a time to take pause and really survey our lives and take note of how God has provided for us over and over again. God is so good and He is the One who provides the harvest. May we never take this for granted and remember to thank Him not only on Thanksgiving Day, but throughout the year. We should be unceasingly thankful for His bounty. We here at WhatChristiansWantToKnow.com want to extend our deep gratitude to you, our loyal readers. We are so thankful that God is using us to spread His Word and we pray that you are continually blessed beyond measure. But most of all “Thanks be unto God for his unspeakable gift”. (2 Corinthians 9:15). It is a gift that is so profound that sometimes we have trouble even telling others about it. It is a gift that is freely given and oftentimes we don’t even think to share it. It is a gift born of extreme sacrifice; a sacrifice that was freely given with joy. A sacrifice that we see in our precious Jesus, the author and finisher of our faith (Hebrews 12:2). What He endured for us is indeed unspeakable, unbelievable, and truly remarkable. We pray that you use this Thanksgiving Holiday or harvest festival time to share the gift of grace with those that need to hear it. We pray that you are able to spend uninterrupted time in “Thanksgiving and Praise to our beneficent Father who dwelleth in the Heavens”. For He alone is worthy. Thanks for the History lesson about Thanksgiving. I’ve got fond memories of heading to the Plymouth Plantation around this time of year as a child (having grown up in Massachusetts,) where actors would be living the life of a pilgrim as close to the real thing without actually living there. When we examine what those people went through, and look at our toughest times today, individually speaking, we’ve got more to be thankful for than ever. Even through our toughest times, the Father’s still got things working for us in one way shape or form. He is worthy of all praise and all thanks!! Great article, and God bless you! Thank you for the words of encouragement Brian. It was my pleasure to share a little history and help us all to remember that Thanksgiving holiday is more than just a time to enjoy good food, friends and family. I’m Jamaican and we don’t have a national holiday for thanksgiving but in some of our churches we do celebrate harvest, which amounts to giving God thanks for being our provider. I believe that a thankful heart inspires true Christian worship in that, once we start to focus on the goodness of God towards us it hard hard not to fall madly in love with Him. Great Article, and Happy Thanksgiving to you and your readers. true thanksgiving is born of faith and faith will always move God in your direction…. Hello Ralston, Thank you for your kind words and for letting us know about what happens in Jamaica. 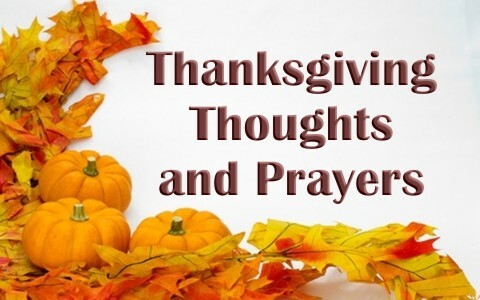 I love how even in a country that does not have a national holiday we still find folks who know in their heart that they need to give thanks to the One who provides the harvest. Blessings to you! Thanksgiving is a great day.May Christ Jesus be blessed;I enjoy it with friends,family and the church. Previous post: What Did The High Priest Do On The Day Of Atonement?